The Unicorn and the Wasp sort of fills the “celebrity historical” niche in the fourth season. Normally in a Davies season, these episodes tend to be situated in the first three episodes of the season – The Unquiet Dead, Tooth and Claw, The Shakespeare Code. However, the opening historical adventure here was set in ancient Pompeii, a long way from the fun running around adventures that audiences expected in the season’s first historical. 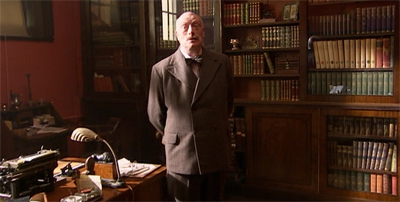 The episode was built on heavier matters – exploring how or why the Doctor couldn’t change history to save innocent lives. Despite the fact that The Fires of Pompeii is notably darker than the traditional opening historical episode, it’s worth noting that The Unicorn and the Wasp is considerably lighter. Episodes like The Unquiet Dead, Tooth and Claw and The Shakespeare Code tend to draw on the iconography and atmosphere of the Philip Hinchcliffe era of the show. They are the sorts of adventures you could imagine Tom Baker having in his deerstalker cap around deary BBC period sets. Those earlier celebrity historicals feature legitimately scary monsters – witches and ghosts and werewolves. 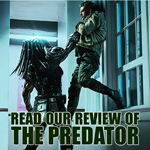 They put the fate of the entire planet at stake, as some unspeakable evil threatens to escape from where it has been locked away, hungry for conquest and for warfare. On a more basic level, the bulk of the action in those stories seems to unfold at night, as if these creatures only haunt the shadows and the darkness. In contrast, most of The Unicorn and the Wasp unfolds during the day, in brightly-lit surroundings. 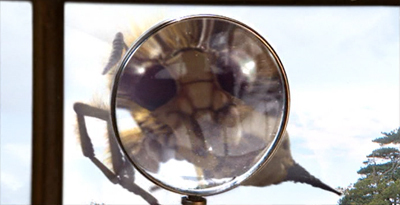 The monster of the week isn’t a traditionally scary monster, it’s a giant wasp. 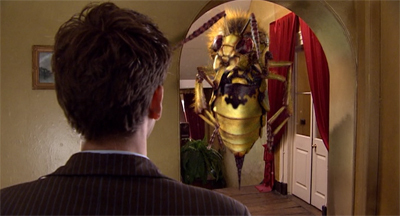 Yes, giant wasps can be scary, particularly if you’re allergic, but it’s brightly-coloured and more of a surreal shout-out to the works of Christie than something children have been having nightmares about for centuries. And the monster of the week doesn’t want to build an empire or commit genocide. He just wants his mother’s love. Indeed, the wasp itself is a fantastic CGI creation, but there’s something intentionally and brilliantly cheesy about the transformation sequences between human and gigantic wasp. There’s a dramatic whisp of smoke – purple smoke! – to lend the whole thing a gleefully theatrical air. It feels rather old-fashioned, especially when compared to – for example – the painful physical transformation in Tooth and Claw. It’s not too difficult to imagine the transformation sequences here as an update of similar sequences in 1970s Doctor Who, albeit with more technical skill involved. 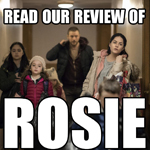 The Unicorn and the Wasp does have some very dark elements at its core, particularly concerning its handling of Christie as a character and the subtext of her disappearance. 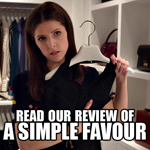 However, those elements are buried quite cleverly amid a selection of clever and witty gags, and riffs on familiar murder mystery tropes. 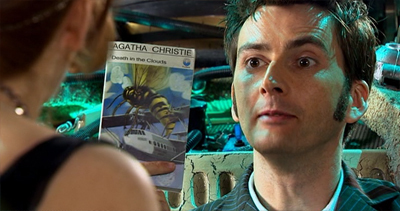 An early The Unicorn and the Wasp, for example, features Gareth Roberts riffing on the “flashback alibi” tropes so common in television and film mysteries. 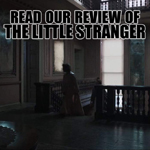 He subverts the narrative given by the characters, he plays with flashbacks-within-flashbacks, and he even gives us an absent-minded flashback from one of the investigators. Roberts has great fun here playing with audience expectations. There’s even a lead pipe! It’s basically a Christie mystery where “the murderer’s an alien.” Roberts even slips in some nice red herrings, playing with the idea that identifying the alien is as important as identifying the murderer. It’s hard not to grin a little bit when Robina remarks that she was “positively buzzing with excitement about the party and the super fun of meeting Lady Eddy.” Ha! I knew it, she’s a red herring for the space wasp! Professor Peach in the study with the lead pipe! The Tennant and Tate play very well off one another, and have wonderful chemistry – the fact that the obligatory “Tennant kisses the companion scene” works so very well, and that the kiss itself feels like an after-thought, is a sign of just how much fun the pair are having. I’d argue that Donna is probably the best companion to work with the Tenth Doctor, and the sense of fun at the heart of The Unicorn and the Wasp is one of the primary reasons. The fourth season could get bleak, but it’s easy to imagine an extended series of fun adventures like this featuring Donna and the Doctor. Of course, the chemistry between the two leads is only one part of what makes The Unicorn and the Wasp works so well. The setting is quite ingenious, with the Doctor and Donna gate-crashing a 1920s high society party from the twilight of the aristocracy. Given how everything plays out – with soap opera twists and shocking scandals – it’s almost like Davies’ Doctor Who has briefly crashed into Downton Abbey, a show that wouldn’t air until two years after The Unicorn and the Wasp. You move on, you get past it. The worst crime, it seems, is not being able to pretend that everything is okay. So Agatha Christie pushes her husband’s infidelity to the side, and concentrates on appearing sociable and friendly. 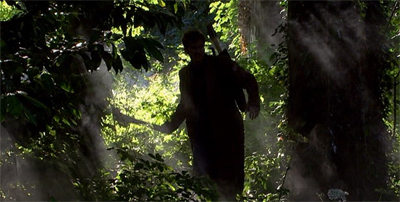 In a way, Davies’ version of the Doctor is the embodiment of this trope – he keeps moving forward, pushing past the pain and suffering and trying not to acknowledge them. Only in the most dire of circumstances is anything less than fine. A jewel of the season? 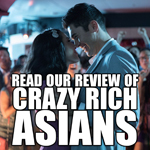 Here we hit some of the interesting gender politics of the fourth season. Davies’ Doctor Who has always been more progressive in its portrayal of female characters than a lot of what came before. Most obviously, female companions no longer exist merely to pass the Doctor test tubes. They are fully-formed characters, with the arguable exception of Martha. And yet, despite that, there’s a sense that a lot of the major female characters are defined by a desire for love and an attraction to the men in their life. Martha was defined by her crush on the Doctor. Whenever she was brought back, the fact that she was married (or engaged to be married) was cited as evidence of how she’d made her way in the world. The fact that the show never seemed too bother who she was married to as long as she was married is a little troubling. In The Sontaran Stratagem, she’s engaged to Tom Milligan from The Last of the Time Lords. In The End of Time, Part II, she’s married to Mickey Smith. It was suggested in Doomsday that Rose was devastated by her separation from the Doctor because she loved him, despite the fact that she had managed to reunite her mother and father and found a brilliant job and had everything else that she could want. 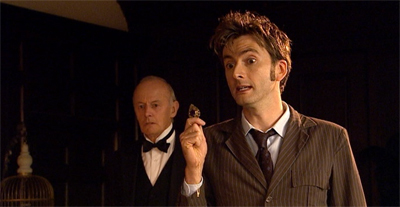 Indeed, Journey’s End sees the plot contorting so that Rose can finally get the man she wants – a copy of the Doctor. In contrast, Mickey Smith decides to stay on Pete’s World to be with his gran, and decides to move home when she passes. Similarly, Donna’s arc will follow a similar pattern. Forest of the Dead will suggest that Donna’s dream life is one where she’s married and has children, with the stinger suggesting that she narrowly missed out on meeting the man of her dreams. 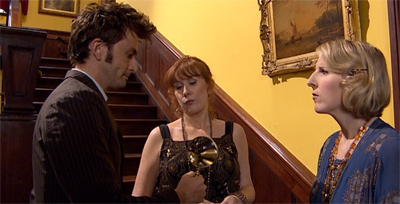 When Davies returns to Donna in The End of Time, Part II, he gives her a happy ending where she is conveniently married off. In fairness, this works a lot better than the Martha or Rose examples, because it gives Donna’s arc a sense of symmetry. However, taken in context, it suggests some troubled gender issues. The Unicorn and the Wasp does feature some strange reverse sexism (“how like a man…”), but it also features a strong female supporting character who refuses to be defined by her marriage. “Er, is, er, Mister Christie not joining us?” Clemency asks. Christie responds, rather bluntly, “Is he needed? Can’t a woman make her own way in the world?” It’s a very valid point, and it’s a nice way of underscoring one of the nicer recurring themes of the season. Donna isn’t romantically interested in the Doctor. Like Christie, Donna has been burnt by a past relationship. And here’s where The Unicorn and the Wasp gets quite dark. Roberts draws from a piece of true history – Agatha Christie’s mysterious disappearance. It’s a subject of much discussion and debate – a mystery in the life of one of the great mystery writers. There are any number of theories. In Agatha Christie and the Missing Eleven Days, Jared Cade suggested that Christie was trying to embarrass her husband, and was shocked by the scale of publicity it received. One of the more recent theories suggests that Christie was in a “fugue state” due to depression and personal issues, related to what was going on in her life at the time. Yes, the party is quite full of White Anglo-Saxon Protestants, why do you ask? A fugue state suggests a period of time when Christie was not herself, from which she has no memory. 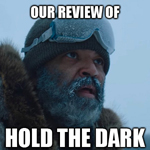 It’s a fairly dark moment for any person. Reportedly Stephen Fry entered a fugue state before travelling to Bruges, without giving anybody he knew any warning or indication. It’s an absolutely terrifying experience to imagine – waking up in a completely different place with no memory of how you got there, or what you are doing. It makes for an effective parallel with Donna, who will find something similar happening to her at the end of the season. Like the death of the Ninth Doctor, it’s amazing how well-constructed and foreshadowed Donna’s fate actually is. The fourth season has a lot of little indicators pointing a lot of different directions (another reference to the bees here! ), but Donna’s fate is a consistent thematic undercurrent that runs through the entire year. 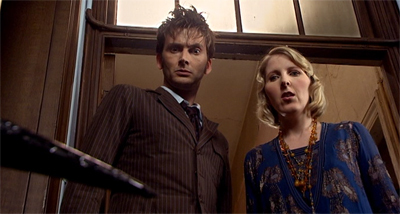 And so the episode’s final reflections from the Doctor and Donna gain a lot more weight on re-watch. Little dialogue touches (like Donna’s fear of being forgotten) seem quite clever, as does the Doctor’s attempt to convince Donna that it’s not all bad. “What happens to Agatha?” Donna asks. “Oh, great life,” the Doctor replies. “Met another man, married again. Saw the world.” Seems like pretty clear foreshadowing, eh? There’s even a little bit of hope. “Somewhere in the back of her mind, it all lingered,” the Doctor observes. Once again, the show seems to focus on legacy and immortality, an appropriate theme for Davies’ final full season working on the show he helped to resurrect. “Well, no one knows how they’re going to be remembered,” the Doctor muses. “All we can do is hope for the best.” It’s not too hard to imagine that Davies was feeling the same way at this point in the show’s run, considering how he might be remembered in the years after he departed the show. Indeed, in keeping with the generally celebratory sentiment of this fourth season, The Unicorn and the Wasp feels very reflexive. Unlike the ghosts at Christmas in The Unquiet Dead, the show doesn’t write off the murder mystery with Agatha Christie as mere coincidence. 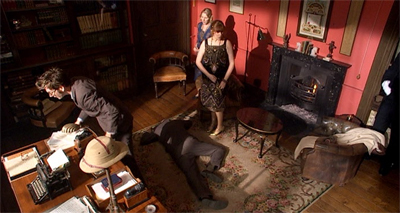 Instead, the show makes a point to reveal that the creature was influenced to craft a murder mystery by the works of Agatha Christie. It’s shaped like an Agatha Christie murder mystery because the creature was inspired by an Agatha Christie murder mystery. In a way, this feels like a reflection of the general trend in the fourth season, where Doctor Who seems to celebrating itself. The vast majority on new series companions return for the season, along with lots of shout-outs to both the classic series and the revival. 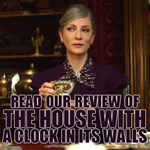 Much like The Unicorn and the Wasp is an Agatha Christie mystery that happens to be shaped in homage to an Agatha Christie mystery, a lot of the fourth season feels like Doctor Who shaped in homage to Doctor Who. 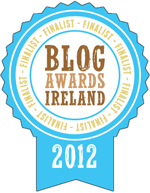 And that is quite brilliant.